More Than Sound, We Make Music. Audio Files from recient White Album Ensemble shows. The amazing JBL VRX932LAP and VRX918SP PA system. JBL SRX712M bi-amp stage and main speakers. Amazing fidelity and volume from minimal size. Lab.Gruppen FP6400 and FP2400Q amplifers. to Create an Event to Remember. Running a typical festival system involves making over 180 connections between 60 components, setting 650 knobs and 145 switches, not to mention multiple digital interfaces and countless menu options. Add the variables of acoustics, changing environments, and dozens of live microphones. Looking at all the speakers, lights and knobs only hint the technical knowledge required to produce just the Right Sound. It's all second nature for us. Achieving a pleasing mix with great definition, the proper levels and processing brings out the best in performers and creates a memorable experience for the audience. This is our highest calling. The Right Sound Company excels in sound production for live music. Years of experience have honed our specialized skills in managing difficult acoustic environments, tight schedules, and demanding artists. We consistently make it all happen with the Right Sound. We have been mixing ethnic and popular music from around the world for more than a decade. Our experience includes Hawaiian, Ethiopian, Brazilian, Tahitian, Eastern and American Indian, Latin salsa and banda, big band, gospel, jazz, bluegrass, zydeco, reggae, rock, disco, hip hop, folk, acappela, and countless variations. 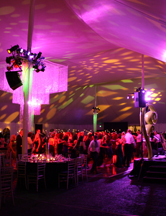 We've handled many festivals, street fairs, concerts, theatrical, receptions, and corporate functions. Also permanent installations, equipment leasing, custom system design, maintenance and consulting. With modular components that are scalable to meet your needs, we provide top quality systems, great personnel, and highly competitive pricing. Whether your event takes place in a conference room or a clearing in the woods, make sure you have the right sound. Contact Us. We'll be happy to give you a list of references and a competitive bid for your next event or installation project.